We have lost a good friend. Jack Pitney, BMW of North America Vice President of Marketing, 47, was just six days away from becoming the Vice President of the U.S. Eastern Region for BMW in a move that would have groomed him for the top U.S. job. Jack was killed yesterday in a tragic accident while on vacation at his farm. He was apparently trying to remove a tree stump with a tractor which flipped over on him causing injuries that were fatal. Jack was one of us in the media/public relations realm before becoming the poster boy for transitioning from an automotive PR guy into an automotive executive with serious responsibilities like the launch of MINI in the U.S. Though he had big assignments, he was always the fun and friendly Jack we used to know, he never changed - always greeting me with a big warm smile at auto shows, in the lobby of the BMW New Jersey headquarters or wherever. I knew Jack for more than 20 years, starting from his PR days on the West Coast. Jack was destined to make it big, really big, before yesterday's tragic accident that took him from us. The new, refined 2011 Nissan Murano, big brother to the Juke and Rogue, gets a new look and other features from the 2010 model. The second generation Murano, introduced two years ago, gets refreshed with a new grille and bumper design, taillights, 18-inch aluminum-alloy wheel design, new exterior Graphite Blue color and a wood grain hue on Murano LE models, to list a few. All 2011 Muranos feature a standard VQ-series 260 horsepower 3.5-liter DOHC V6 engine with advanced Xtronic CVT™ transmission and Vehicle Dynamic Control and Traction Control System. Interior enhancements for 2011 include a new white meter color, new center stack colors and added equipment to various trim levels – driver's seat with power lumbar support (SV), RearView Monitor (SV), 7.0-inch color monitor (SV), auto dimming rearview mirror with compass and HomeLink® Universal Transceiver (SL) and heated steering wheel (SL). New audio and entertainment features range from the addition of standard iPod® connectivity and Bluetooth® Hands-free Phone System to SV models to a Bose® audio system with nine speakers plus dual subwoofers for SL models. Other available technology includes an advanced touch screen Nissan Navigation System with 9.3GB Music Box™ hard drive. The 2011 Murano, which is set to go on sale at Nissan dealers nationwide in mid-October, is offered in eight models, in front-wheel drive or an Intuitive All-Wheel Drive system, with the SV FWD and SV AWD being new to this line-up: S FWD, S AWD, SV FWD, SV AWD, SL FWD, SL AWD, LE FWD and LE AWD. Murano is an attractive vehicle that stacks up well against its luxury competitors like the Lexus RX350, Audi Q5 and Acura MDX when fully loaded. General Motors grabs another marketing exec from Hyundai, though technically Joel Ewanick had a brief two month stop at Nissan en route to Detroit. 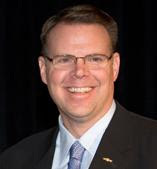 Chris Perry has been named vice president, Chevrolet marketing, effective immediately, joining the brand from Hyundai Motor America where he was vice president, marketing. He rejoins Ewanick and will report to his old boss who is General Motors U.S. Vice President of Marketing. 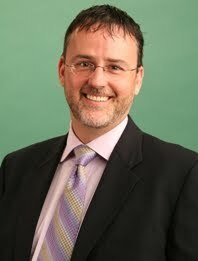 Perry joined Hyundai in 2000 as the head of brand planning. 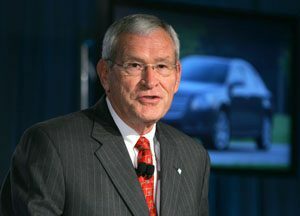 While at Hyundai, he progressed through a variety of brand, marketing and advertising positions, before being named vice president, marketing communications in April, 2010. Prior to joining Hyundai, Perry spent nearly 10 years at American Isuzu Motors, where he held a variety of marketing and advertising positions. 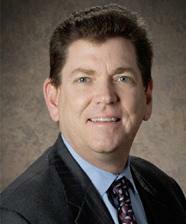 Perry replaces Jim Campbell, who is named vice president, Performance Vehicles and Motorsports. In his new assignment, Campbell will be responsible for integrating the engineering and marketing of performance versions of current production models, as well as all motorsports activities. Before serving as vice president, Chevrolet marketing, Campbell led GM's Fleet and Commercial Operations. Prior to Fleet and Commercial, he held various positions in field sales, retail incentives, marketing and customer relationship management. He has broad experience with performance vehicles like Corvette and Camaro and has worked extensively across a variety of race series, including NASCAR, American Lemans Series and Grand Am Road Racing. Campbell will report to Mark Reuss, president, GM North America, and Tom Stephens, vice chairman, Global Product Operations. Perry will report to Ewanick and Hyundai will again search their bench and elsewhere in their second search for marketing chief this year. Chrysler released images of the new 2011 Jeep® Wrangler and Wrangler Unlimited which went into production earlier this week at the Toledo Assembly Complex in Toledo, Ohio.The new 2011 Jeep Wrangler interior highlights include a redesigned instrument panel and new storage areas with improved ergonomics and upgraded materials. A new lockable console and upgraded door armrest areas boast comfortable touch points, while a redesigned center stack is easier to reach and operate. Heated, power mirrors are now available, and drivers and passengers will enjoy enhanced visibility courtesy of larger rear windows. All-new steering-wheel controls allow the driver to operate the radio, cruise control, hands-free phone and other vehicle functions while keeping hands on the wheel. A new USB device interface connects to storage devices (thumb drives and most MP3 players) for use with the vehicle's Media Center, which now includes streaming Bluetooth audio. Twelve-volt accessory outlets have been added and a new 110-volt outlet is available to provide power similar to AC outlets in the home. 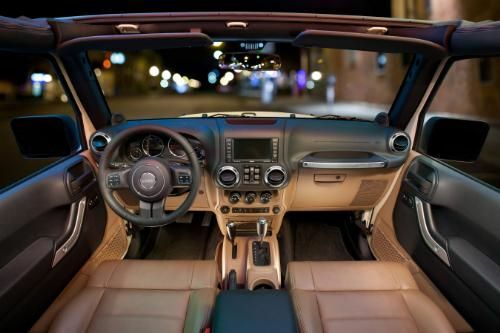 The 2011 Jeep Wrangler and Wrangler Unlimited Sahara models have an all-new, premium, body-color hard top. Several new Jeep Wrangler colors are available for 2011, including Detonator Yellow, Deep Cherry Red, Sahara Tan, Cosmos Blue and Bright White. General Motors has filed a registration statement on Form S-1 with the SEC for a proposed initial public offering (IPO) consisting of common stock to be sold by certain of its stockholders and the issuance by the company of its Series B mandatory convertible junior preferred stock. The amount of securities offered will be determined by market conditions and other factors at the time of the offering. The number of shares to be offered and the price range for the offering have not yet been determined. Morgan Stanley and J.P. Morgan (representatives of the underwriters), BofA Merrill Lynch, Citi, Goldman, Sachs & Co., Barclays Capital, Credit Suisse, Deutsche Bank Securities, RBC Capital Markets, and UBS Investment Bank will be the joint book-running managers for the offering. When available, copies of the preliminary prospectus relating to the offering may be obtained for free, by visiting the SEC website at http://www.sec.gov. Will you buy GM stock? 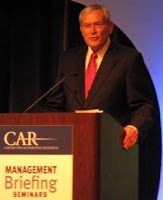 General Motors Chairman and CEO Edward E. Whitacre, Jr. will step down as chief executive officer on September 1, 2010, and as chairman of the board by the end of the year. Dan Akerson, 61, who has served on the GM board of directors since July 2009, will become CEO on September 1 and chairman by the end of the year, ensuring a smooth transition and continued positive momentum for company. Whitacre, 68, joined GM as chairman of the board on July 10, 2009. On December 1, 2009, he was named chief executive officer. In addition to serving on the GM board since July 2009, Akerson has had a distinguished career in finance as a managing director at the Carlyle Group and in telecommunication, serving as chairman and chief executive officer of XO Communications and at Nextel Communications. He was also chairman and CEO of General Instrument Corp.
General Motors Company recorded second quarter revenue of $33.2 billion producing net income attributable to common stockholders of $1.3 billion, resulting in earnings per share on a diluted basis of $2.55. GM's second quarter earnings before interest and tax (EBIT) was $2.0 billion. GM North America's EBIT in the second quarter was $1.6 billion, up from $1.2 billion in the first quarter. GM Europe had a loss before interest and taxes of $0.2 billion, an improvement of $0.3 billion from the first quarter. GM International Operations posted EBIT of $0.7 billion, down from $1.2 billion in the first quarter. Cash flow from operating activities was $3.9 billion and after adjusting for capital expenditures of $1.1 billion, free cash flow was $2.8 billion. GM ended the second quarter with $32.5 billion in cash and marketable securities, including funds in the Canadian Health Care Trust escrow. The 2011 Nissan all-new JUKE will have a starting Manufacturer's Suggested Retail Price of $18,960 (excluding applicable tax, title, license and destination charges) when it goes on sale in October. That's just $1,500 less the starting price of its bigger sibling the Rogue. The 2011 Juke is available in eight models, with a standard 188 horsepower 1.6-liter Direct Injection Gasoline Turbo engine mated to a choice of two transmissions, the Xtronic CVT™ (Continuously Variable Transmission) with S-Mode and a 6-speed manual transmission (SV FWD and SL FWD models only). Fuel economy is rated at 27 mpg City and 32 mpg Highway for JUKE CVT FWD models. New Saab Story Comes From "A Perfect Storm"
Saab Chairman Victor Muller, also CEO of Spyker cars of the Netherlands, speaking at the CAR Management Briefing Seminars in Traverse City last Thursday, calls his deal to buy Saab from General Motors the result of "a perfect storm" - GM went bankrupt and was reorganizing in early 2009 and put Saab up for sale when other OEMs were struggling and no other big players could justify a purchase - Muller paid $74 million, the price of a wind tunnel, for one billion euros worth of assets. Also, Saab will be partnering with GM through 2024, according to Muller. Muller says the new 9-5 sedan arriving in showrooms this week will compete with the Audi A6, Mercedes-Benz E-Class and BMW 5 Series. Muller says the Saab 9-4X crossover which shares components with the Cadillac SRX will begin production in April of next year and an all-new Saab 9-3 is coming in 2012. Saab production levels have plummeted from 120,000 to 130,000 just three years ago. Muller is looking to looking to lower the break-even production level to 85,000 vehicles, starting off this year at 50 to 60,000 and hopefully reaching 100,000 next year. Muller's math to profitability is that currently 1.5 million people own a Saab and 4.5 million at some point have driven a Saab so getting old customers back is the ticket. Those customers went to Audi, followed by BMW, Mercedes-Benz, and Volvo. Also ridding the perception that a Saab is a "glorified Opel". Another reason that sales slid was that an old model was coming off the line which may be able to bring a customer back twice but at 13 years since a redesign business drys up. Muller is "looking for a bright future" and has plans for a 9-3 hybrid and EV (electric vehicle) and hopes for a revival of the 9-2, the premium A segment small car that gave Saab dominance in the 1950's and '60's. In the fullness of time we'll know if Muller's love for the brand, "perfect storm" purchase and business model will bring back customers and make the Saab flourish again. 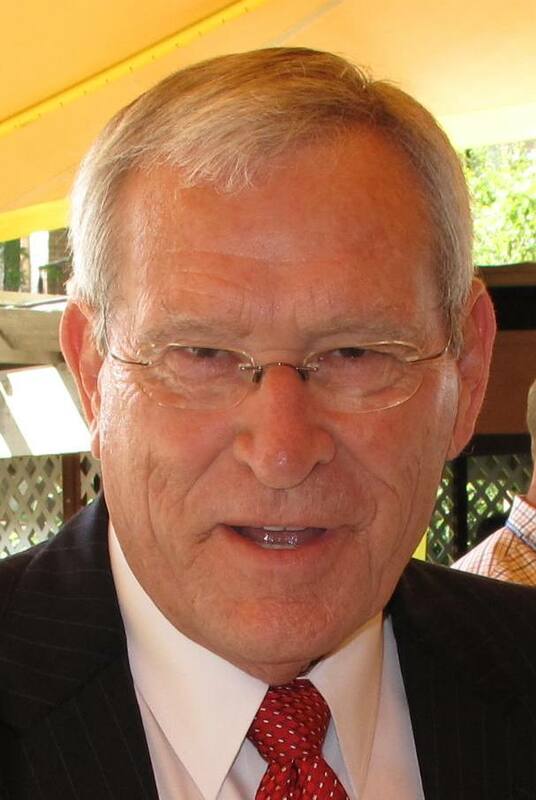 Ed Whitacre, a 68 year old Texan who spent 44 years at AT&T (previously SBC) serving as its Chairman for 18 years before retiring in April of 2007, took over as Chairman of General Motors in June 2009 after receiving a call from the Treasury Department. After initially telling them "no", he thought that having "always been a GM owner", he should reconsider. Whitacre told the audience at the Center for Automotive Research Management Briefing Seminars in Traverse City that "I took this job out of a sense of duty – the country put a lot of faith in GM and in the industry, and I wanted both to succeed." "First, we clarified the company’s focus. Today, GM has a clear and simple vision: “Design, build, and sell the world’s best vehicles.” That’s what we do… that’s all we do." "Second, we reinvigorated the team and restructured the organization." "In addition, we have brought new blood and fresh thinking into the management team … while retaining the auto expertise that is so important to our success. It has also allowed us to open up opportunities for many of our younger talents – Mark Reuss running our North American team is a great example." "Third, we’re moving faster and smarter. We’re changing the way we do business at GM – doing all we can to make smart decisions and make them fast… while clearing the underbrush that can impede good thinking." "In June, for example, we launched a new subsidiary called GM Ventures to identify and develop new technologies." "The fourth key to our ongoing turnaround – we’re making vehicles that people just can’t wait to buy. Of course, as I’ve come to learn, it takes years to bring a new vehicle to market. So we owe a debt of gratitude to the people who had the foresight to develop these awesome cars and trucks – people like Rick Wagoner, Fritz Henderson, Bob Lutz and others. And I’m happy to report that the products we have in the pipeline are just as exciting as the ones we’re selling now. So, that’s the foundation for GM’s turnaround." First, is the industry’s growth potential. In China, GM’s first half sales this year were up almost 50 percent compared to 2009. That’s one reason we’ll roll out more than 10 new or upgraded products in China this year alone. GM is selling more vehicles today with four brands than we were last year with eight, which is very positive. The second big industry opportunity we can all be excited about is technology. That’s why we’re so excited about the new Chevy Cruze Eco, which will get 40 mile-per-gallon on the highway.... We have aggressive plans to expand the number of hybrids and plug-in vehicles in our portfolio… and I know many of you are working on the same challenges at your companies. The opportunities are huge… and we’re just beginning to see the possibilities. The third opportunity is bringing innovation to how we market our products. Last week, for example, Chevrolet became the first brand to pilot an app for the iPhone and iPad that allows salespeople to sell vehicles anywhere, anytime...."
"In fact, today, I’m pleased to announce that we concluded our dealer arbitration process, paving the way for the new GM dealer network. Starting November 1, we will have a network of about 4,500 U.S. dealerships in place to sell and service our Chevrolet, Buick, GMC, and Cadillac brands… and it will be the best network in the business. The GM dealer network will be the right size… and have the right dealers… to make our customers happy and keep them coming back. Our network will be about 25 percent smaller than it was, but it will still be the nation’s largest. In the mean time, we’ve embarked on what we believe is the largest facility makeover the industry has ever seen. So far, we’ve updated more than 300 facilities; we expect to update more than 1,000 by the end of this year. For the first time in a while, our dealers are fully devoted again to what they do best…focusing on our customer. So, GM has come a long way in a year’s time…and so has the industry. In fact, I’d like to congratulate Chrysler and Ford for their progress during this period…as well as the suppliers, who toughed it out with all of us. Now, we’re on our feet again… getting into fighting shape… and taking the fight back to the marketplace." In the Q and A that followed, Whitacre repeated that the government bailout loan has been paid back but they, the Government/taxpayers, still have a lot of equity/ownership in GM. He expects the upcoming IPO (Initial Public Offering) of stock to be the biggest in U.S. history. He doesn't like being called Government Motors saying "it turns off customers". He said "the timetable (for the IPO) is not there yet" with an S1 report still needed to be filed with the SEC. Whitacre is optimistic that things are improving with dealers apparently screaming for vehicles and GM working hard to produce them. He says next week's second quarter earnings release will surprise people on the heels on GM's first quarter profit. Whitacre admitted that he now has his first Corvette and "no speeding ticket". He concluded by saying an all-new, redesigned Chevrolet Corvette will be coming soon. Whitacre's rare speaking engagement seemed to impress the crowd. His delivery was simple and stated a straight forward mission and plan of execution, but keep mind this gathering depends on GM's success and survival, as do all us U.S. taxpayers. Toyota's Steve St. Angelo: "Extremely Focused on Improving Quality"
Steve St. Angelo, Toyota's chief quality officer for North America, claims that failing to get an acting role on the TV show Welcome Back, Kotter in 1970's forced him into the automotive industry. Fast forward to today when Toyota has been raked through the media and Washington Congressional hearings over floormat/pedal interference, unintended acceleration and sticky gas pedals and St. Angelo delivers a passionately emotional speech to an automotive audience saying that after rigorous internal and third party testing "there is nothing wrong with the electronics" and that's with 40 million Toyotas on the road today. Using Exponent, a company with scientists and engineers, to test every electronic throttle control system, past and present, St. Angelo says they "can't find anything" that would have caused the reported incidents that have dominated news headlines for nearly a year. Since March, in an effort to "go to the problem and see it for yourself" St. Angelo has been traveling to Japan every other week to Toyota's proving grounds where vehicles are put through magnetic fields to check for potentially damaging effects. Nevertheless, St. Angelo reiterates that Toyota never comprises safety in its vehicles and needs to listen to its customers to make improvements to quality. St. Angelo says Toyota is doing more testing in the development stage before mass production begins, has 1,000 more engineers dedicated to quality assurance, six more offices related to quality and "smart" expert response teams who evaluate quality and go into the field to inspect vehicles. He says brake override will be standard by the end of the year. He points out that the industry will have 20 million vehicles recalled this year, the most since 2004. Despite the recalls and economic recession, Toyota made no layoffs worldwide, including among its 35,000 employees in North America. Toyota has a $23 billion investment in 14 U.S. plants including Mississippi that will produce Corollas, bringing production of that popular car back to the U.S. St. Angelo says that 200,000 Americans have jobs because of Toyota. He recommends reading One Team, All Levels, an employee-written book on the Toyota culture. The message is that Toyota is doing all it can do about quality and is being transparent with the results. Government findings and expert panels all seem to conclude that driver error is the culprit and manufacturers are making fixes to compensate for them plus adding many new safety systems. At the CAR Management Briefing Seminars in Traverse City, Ford, for example, said it's reducing its supplier base from 3,000 to 750. With that many suppliers and thousands of vehicle parts it's truly amazing that more doesn't go wrong. The bottom line is that these are complex vehicles with drivers who need to be better educated and tested to operate them. General Motors July sales for Chevrolet, Buick, GMC and Cadillac increased by a combined 25 percent to 199,432 units. Year-to-date total sales for GM’s four brands have risen 31 percent to 1,269,009 units, while retail sales for GM’s brands have risen 18 percent. Ford, Lincoln and Mercury dealers delivered 170,208 new vehicles in July, a 3 percent increase versus a year ago, when “Cash for Clunker” sales started to surge. Year-to-date sales totaled 1,151,560, up 23 percent. Toyota Motor Sales reported July sales of 169,224 units, a decrease of 6.8 percent from the same period last year, on a daily selling rate basis. On a raw volume basis, unadjusted for 27 selling days in July 2010, compared to 26 selling days in July 2009, TMS sales were down 3.2 percent compared to the same period last year. Year-to-date, Toyota has sold 1,015,766 vehicles, 7.5 percent more than in the first seven months of 2009. American Honda posted July sales of 112,437 vehicles, a decrease of 5.6 percent and year-to-date sales reached 706,346, an increase of 9.4 percent versus last year. Chrysler reported U.S. sales of 93,313, a 5 percent increase compared with sales in July 2009. July represents the fourth consecutive month of year-over-year sales increases. Year-to-date Chrysler has sold 620,532, an 11 percent increase. Nissan North America reported July sales of 82,337, an increase of 14.6 percent compared with July 2009. Year-to-date Nissan sales are 522,669, up 24.6 percent. Hyundai Motor America announced sales of 54,106 vehicles in July, a 19 percent increase compared with the same period a year ago. This represents an all-time sales record for the month of July and marks only the fourth time Hyundai has surpassed 50,000 units in a month. Year to date, Hyundai sales are 309,888, up 24 percent versus 2009, a performance that represents an all-time record for the first seven months of any year. Kia Motors America announced record July sales of 35,419 units, a 20.7 percent increase from July 2009 with year-to-date sales of 205,488 up 16.3 percent. Volkswagen of America reported July sales of 23,880 total units, for a 16 percent increase over July 2009, and its thirteenth consecutive month of sales growth. For the year-to-date, Volkswagen's sales have risen 27.5 percent versus the same time frame in 2009.Separately, Audi recorded 7,817 sales, a 22 percent rise compared to July 2009 and for the first seven months of 2010 sales are 56,257, a 27.1 percent increase. Subaru of America reported July sales of 23,983, a 10 percent gain over July 2009 and year-to-date sales are 149,943, a 30 percent rise over last year's record pace. The BMW Group in the U.S. (BMW and MINI combined) reported July sales of 23,390 vehicles, an increase of 10.1 percent from the 21,253 vehicles sold last year. Year-to-date, the BMW Group reported sales volume of 144,975 vehicles, up 6.8 percent from last year. Mercedes-Benz USA reported July sales of 18,048 vehicles, an increase of 11.2 percent. On a year-to-date basis, the company sold 125,015 new vehicles, an increase of 23.4 percent over last year. Mazda North American Operations reported sales of 20,732 vehicles, an 8.9 percent increase. Year-to-date sales through July stand at 136,451, and are outpacing last year's sales at this time by 14.3 percent. Mitsubishi Motors North America July sales of 5,648, an increase of 16.5 percent compared to July 2009 and Mitsubishi’s highest monthly sales total since August 2009. American Suzuki reported July sales of 1,952, a 44 percent decline from a year ago. Year-to-date Suzuki sales are 25,915, a 48 percent plunge from 2009. The new 2011 Ford Explorer will have optional inflatable second-row seat belts that are triggered with airbags in the event of a crash but only if the seatbelt is buckled up. A cold gas is channeled from a canister below the rear seat through the belt into the airbag (seen deployed above). As a opposed to an airbag which inflates at you, the seatbelt device inflates away from you. Ford says rear seat passengers, often children or mature passengers, can be more vulnerable to head, chest and neck injuries.The Ford inflatable belts spread impact forces across five times more area than conventional seat belts. This reduces pressure on the chest while helping to control head and neck motion. Belt comfort also should help increase usage rates. 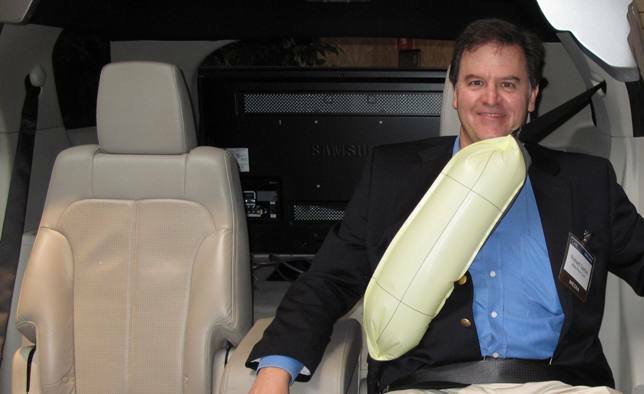 Studies show inflatable belts to be more comfortable for passengers due to the padding. It's an industry-first from Ford. 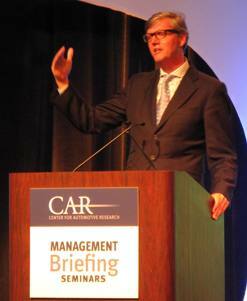 The Center for Automotive Research Management Briefing Seminars kicked off this morning in Traverse City, Michigan, with manufacturing executives from the Detroit 3, BMW and Honda speaking on strategies and methods they've engaged to improve the product and process while UAW President Bob King bestowed the merits of unions and the fact they are an essential part of every democracy. 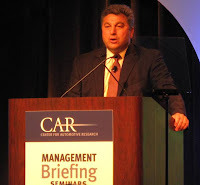 Chrysler's Senior V.P., Manufacturing Scott Garberding described Fiat's role, investments of about $1.2B in new engines and transmissions and their World Class Manufacturing banner which encompasses eliminating waste, developing new tools for manufacturing, cleaning and painting machinery and facilities and the allocation of 30 people per plant to handle fit and finish issues. 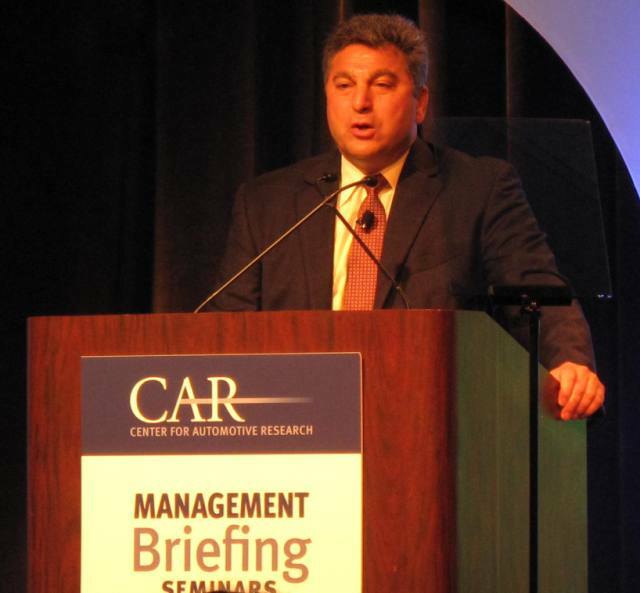 Garberding says "there's a new spirit of teamwork at Chrysler." Ford's V.P. of North American Manufacturing, Jim Tetreault, extolled how the One Ford plan of the past 3 1/2 years has brought flexibility and the ability to change the model mix in response to consumer demand. Tetreault explained how their detailed virtual manufacturing efforts create an ergonomically conducive setting for workers before the equipment is even made and how reprogrammable tools eliminate the need for replacements - a time and money saver. GM's V.P., Manufacturing and Labor Relations, Diana Tremblay, stated the mission of delivering "products people want" and finding fast solutions using existing assets such as using the Buick Lucerne and Cadillac DTS platform to make the new Volt extended-range electric car. Tremblay says there's more employee involvement and GM's suppliers now know the plans well in advance so they can prepare for upcoming vehicles. Other speakers discussed recycling, energy saving developments and the importance of good communication. More to come from Traverse City, the northern Michigan town that prides itself as a prime cherry and wine producing region.